The transformer oil regeneration system ZYB serves for regeneration of insulation oil to its virgin characteristics. The system also provides filtration, drying, discoloration and removal of particulate, sludge and other soluble oil decay products. Application of the system allows acid number of oil to be improved. 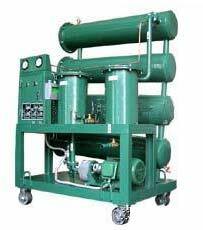 It is used to regenerate insulating oils in transformers that are being installed or repaired. It is applicable for high-voltage power transformers, switches, i.e. high-voltage equipment. 1.To remove free, soluble water, carbon, free and dissolved gases and particulate matters from insulating oil effectively and rapidly. 2.Enhance the value of breakdown voltage greatly. 9.Various sizes and configurations (shield) available. 1. Unique demulsification system adopted Japanese H.P.M demulsification devices that are made of high-molecule polymeric material. 2. Unique dewatering and degassing system that is a perfect combination of coalescing separation at the constant pressure,3D stereo-evaporation technology under the negative voltage and G technology. 3. Distinctive removing impurities system filtering through double FH trapezoidal network and absorbing by high polymer without the mechanical power. 4. Very safe and reliable heating system,heating by s-shaped gradually dense carbon fibre infrared radiation.